Talk about being filled with weeds. Ames Long Pond, known as Ames Pond is an absolute mess but that doesn't mean there isn't good fishing in there. For the most part, I have only fished Ames Pond from the shore but I have a had a lot of success. There are three distinct sections of Ames Pond and I have caught fish in all three. I refuse to use anything but a Texas rig weedless worm here just because the weeds are so thick. When it gets warm out, the fish are right on top of the shore. I've got fish 3 feet from the shore on more than one occasion. Ames Pond is a huge body of water that extends a lot further than the eye can see. 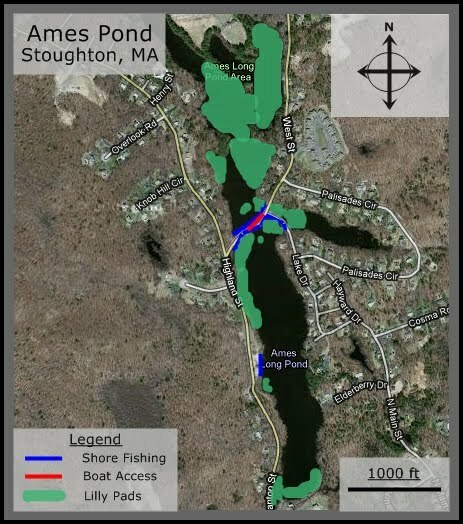 Ames pond is the widest on the shores of West St which gives you plenty of room to fish on land. If you fish on the southern half of the pond, I would suggest working the western shore (to the right if you're looking from the street). There are a lot more lilly pads over there, especially close to West St. When fishing from the shore, I spent almost all my time working the western shore because there are constantly bass breaking in the lilly pads. If you fish the northern half there are a lot more inlets and coves where the water gets warm and are great for spawn beds. I haven't had much luck on the northern side but I think that's because it was just too expansive and too early in the season when I fished it. I have a feeling if I went out there now, the fish would be where we thought they would've been last time. There is also a beach on the southern half which you can access from Highland St in Easton (the pond is on the town line). There are some lilly pads off to the right of the beach but also some bass feed right out in front of the beach. I walked about knee deep into the water and cast straight out and was getting plenty of hits. Ames Pond can be very frustrating due to the weeds but there are definitely fish in there. I like this spot because it is really challenging and I know there will always be fish where ever I'm casting. Boat Access? Yes on West St.